Surprisingly, many of the problems associated with sobriety do not stem directly from drugs and alcohol. Instead, they are associated with physical and psychosocial changes that occur after the chemicals have left our bodies. 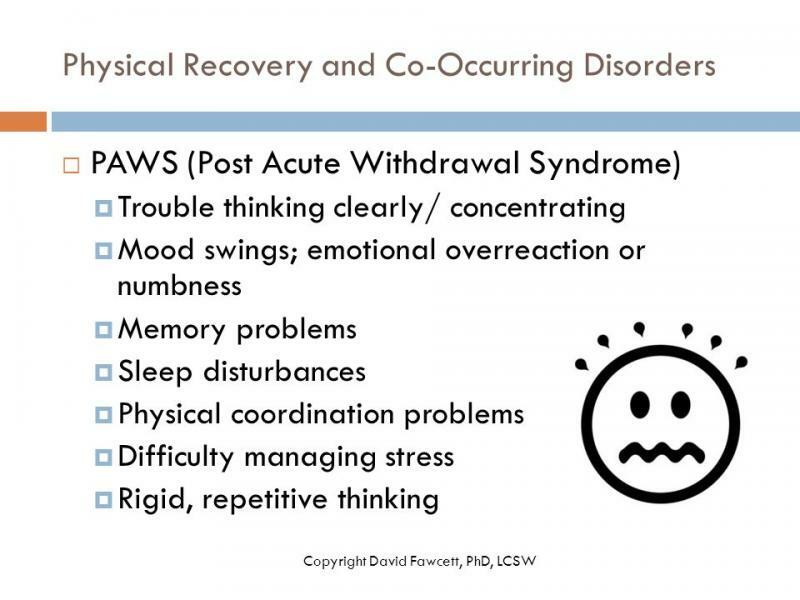 These alterations in our nervous systems, physical condition, and psychosocial adjustments are known as post acute withdrawal syndrome (PAWS). Post acute withdrawal results from: (1) the combination of damage to our bodies and nervous systems as a result of using addictive chemicals, and (2) from the psychosocial stresses of coping with lives without alcohol and drugs. 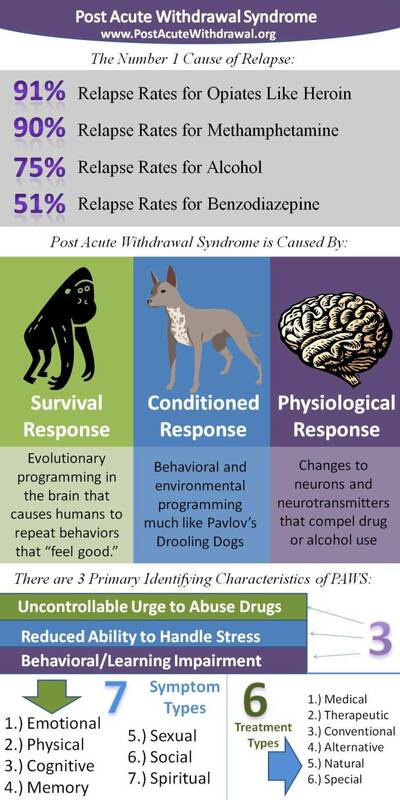 PAWS is the cause of most relapse. Recovery causes a great deal of stress. Many addicts and alcoholics never learn to manage stress without alcohol or drug use, or do so only after many attempts at sobriety. All addicts and alcoholics suffer from damage to our bodies and nervous systems resulting from drug/alcohol use, accidents and malnutrition. We may also suffer from various chronic diseases, such as diabetes and hepatitis. We usually bring to early recovery a broad array of other problems. As one alcoholic put it, When I got sober, things didn't get any easier, but they got real clear! Our ability to deal with these problems depends on our willingness to take care of ourselves, manage our stress, and maintain a healthy physical, emotional and spiritual lifestyle. The symptoms of PAWS reach a peak from three to six months after we get clean. Recovery from damage to our nervous systems usually requires from six months to two years with a healthy program of recovery. Any use of drugs or alcohol, even in small quantities or for a short time, will effectively eliminate any gains.